Wake up to the ExactSet™ precise time while listening to your favorite radio station! The ExactSet™ clock sets itself using radio waves to the U.S. Atomic Clock, so you’ll never have to set your clock again. Stylish and contemporary, this combination alarm clock radio is perfect for any nightstand or desk. 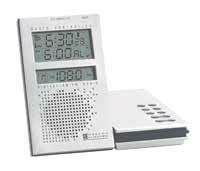 HiGlo™ LCD shows time/day/date display, AM/FM radio frequency, dual alarm setting, and low battery warning. Alarm with 8 minute snooze and radio sleep timer programmable up to 120 minutes. Actual size:6.75" x 0.88" x 5.25"